This Friday, historian and author, Hanne Blank, will be here reading from and discussing the updated edition of her book, Big Big Love, which features new interviews with body-acceptance activists, health coaches, psychologists, and more! Big Big Love’s savvy, sane advice can help you tackle every hot-button issue you may confront in the bedroom and in love. Join us for cupcakes and adult beverages, 7-9pm! This weekend is the Baltimore Book Festival. And there are a lot of very exciting things going on over in Mt. Vernon to celebrate. But one of the projects we're most excited about is a book curated by our friend Alex Fine called Hairy Baltimore. The limited edition book contains 40 portraits of Baltimore icons with distinctive hairstyles by a bunch of great artists, including: Okan Arabacioglu, Derrick Dent, Donald Ely, Alex Fine, Daniel Fishel, Jimmy Giegerich, Andrea Kalfas, Daniel Krall, Hawk Krall, Jeff Lance, Cameron K. Lewis, John Macnair, Emma Maatman, Noah Patrick Pfarr, Sarah Pfeil, Thomas Pitilli, Jon Sperry, Hanna Viktorsson, Annie Wu. 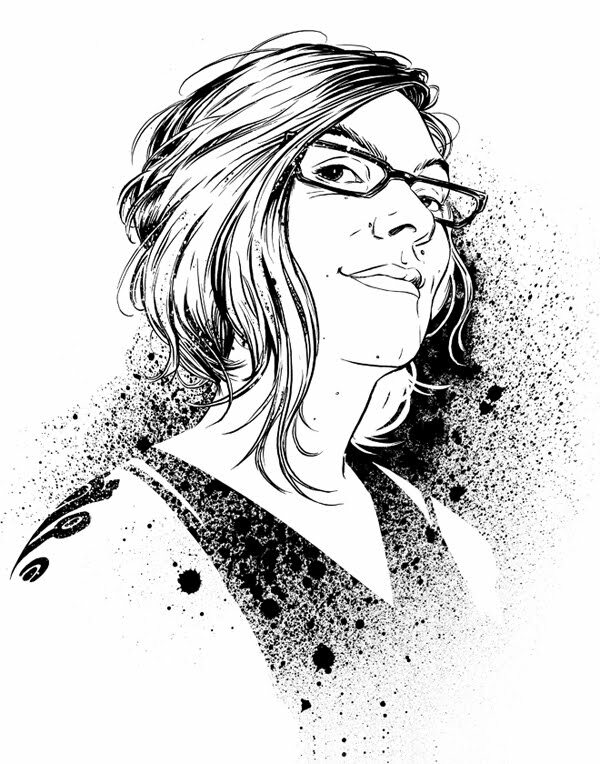 And while we're excited because it's a great idea for project, we're also excited by this awesome portrait of me that Noah Patrick Pfaff did. (He also did a great portrait of our pal Raygun Robyn). We can't wait to see the book and who got illustrated and by which artists. From the folks at the Salford Zine Library! Make sure you get the help of an adult! Tons of this season's great books are rolling in! "We know, we know, the internet, the long tail, and all that, but actually being in the store, surrounded by all those weird and wonderful things to read and look at that maybe you didn’t even know existed until you happened to spot them filed next to something else, is an invitation to impulse buying and, well, better than the internet. There, we said it." Thanks, City Paper! And also City Paper Readers! Here are some more Hampden Winners! Friday night was our annual pre-SPX party and it was a great time! We had some of our own beer, brewed by our friends at Burnt Hickory Brewery. People were just hanging out after the readings. I wish I had taken more photos, as usual. The Ignatz Winners were announced Saturday Night. We were all shocked and saddened to hear that Dylan Williams passed away this weekend. Sunday we headed to Bethesda. Here's a batch of what we got. There's a whole lot more here, which will be updated throughout the week. Thanks to everyone who came to the event! Hope you had as much fun as we did! It's been a crazy long weekend. Here's just one of the wrap ups. More to come! Like any great neighborhood festival you see a lot of your neighbors just hanging out, like the Treksters and Fishboy, and entering Hampden Idol. Our diligent and friendly judges, Sarah Jennings, reigning Hampden Idol, Lee Gardner, editor of the Baltimore City Paper, and Aaron Henkin, host of WYPR's The Signal. Keyboard Man with the finalists. The first annual The Great Baltimore Mac Off was a huge success, raising money for the Hampden Food Bank and offering an amazing array of mac and cheese creations from amateurs and professionals alike. Superhero Series, originally uploaded by sugarfreak. Our Button-o-matic has arrived with the brand spanking new Superheroes Series! Buttons by Jeffrey Brown, Laura Park, Shawnimal, Jay Ryan and more!! Sales on tons of books, comics, DVDs and our own Atomic Books beer will be served. Hey, we have this crazy thing happening in the city this weekend, so here's some helpful tips on avoiding the closed streets. But it's First Friday in Hampden tonight and Celebrated Summer Records is having a Donut Social and we're having a 25% sale on all CDs and DVDs and 50% off all sale items (off their already lowered prices) as well as refreshing adult beverages. We'll be open on Labor Day for our regular hours! Mojo has a 1 page profile of Future Islands. This month's Reading Club pick is The Collected Stories of Lydia Davis by Lydia Davis. See you September 28th for the discussion - 7:30 at Atomic Books! New members are welcome at any time, and you get 15% off all the books for this year's Club titles. Join the Facebook Group for more discussion and updates.